It’s been an exciting year already and we’re only into the second week of January! As most of you will know by now, it’s been a dream of mine to publish a book, and my goal had always been to do that before I turned thirty. I published the ebook in March 2016, and this weekend I will not only be celebrating the big three-oh, but also the fact that I’ve finally made my dreams come true. It only really hit me during my trip home to South Africa in November 2016 that I was an author, and just how big a deal that actually was to the people around me, when I got interviewed by the local newspaper [read more] and then invited to speak to the learners at Kingway High School about ~writerly things [read more]. With an actual, physical, copy of my novel in my hands now though, it’s like the last piece of the puzzle I’ve always needed to finally believe that I’m an author. Cheeky wee selfie before bed! My flatmates were joking that I wouldn’t stop hugging the book last night (I did let it go for a few moments so they could have their turn at least!) and that they were worried they’d find me cuddling it in my sleep the next morning. I can neither confirm nor deny that this may have been a legitimate concern. After spending today looking through the book to confirm that everything was where it should be– it was perfect <3_<3!— all that was really left for me to do was to confirm it via CreateSpace, thus releasing the print edition out into the wilds of the world! Which I did this evening…or rather very-very early this Wednesday morning! It’s immediately available directly through the CreateSpace Store and should be released worldwide through Amazon within the next 3-5days. Though from a quick check it’s already available on the [ US ] site, and it’s listed on the [ UK ] site but at double the price I’ve set it at :/ so I’m not entirely sure what’s up with that but I hope it’ll sort itself out within the next few days. It’s up on both sites at the correct price now! 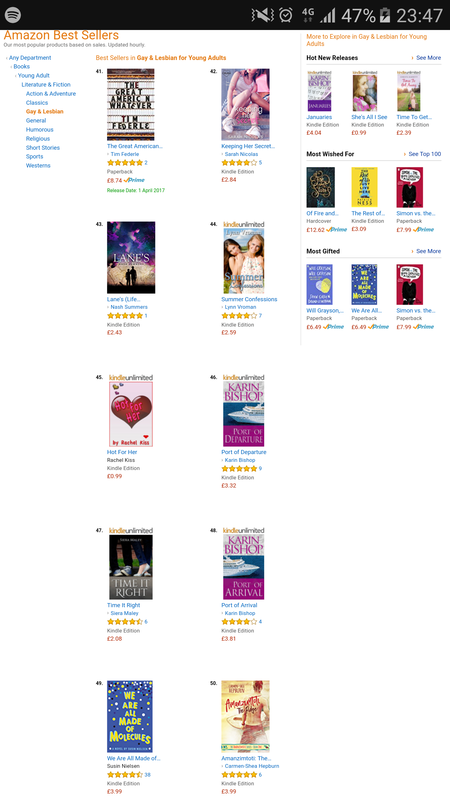 Whilst checking on the status of the print edition, I happened to click into the ebook version- as you do- and noticed that my novel had made the UK Top 50 of “Best Sellers in Gay&Lesbian for Young Adults”! Which was quite exciting. It’s jumped up to #60 now, and I suspect it’ll disappear into the hundreds it had previously been sitting at before too long, but it was certainly a pleasant wee discovery none the less! Amanzimtoti: The Ridge is now available worldwide through all major ebook stores (Amazon, iBooks, Nook, Kobo, etc), and in print format through CreateSpace and Amazon US & UK!